You might say the experience of running a growing small business out of my home kitchen for three years, coupled with my recent reorganization endeavor has been a good reminder of what can stay and what can go. Today I am sharing eight of my non-negotiable kitchen tools that I cannot imagine living without. Tiny spatulas. These beauties are small but mighty. They come in a traditional spatula style, and a new fangled spoontula model. (Part spoon. Part spatula. Spoontula. Get it?) I keep doubles of both styles in my drawer at all times. I use them to scrape thick ingredients out of measuring cups (peanut butter, jam, honey), and to scoop ingredients out of small jars (dijon, mayonnaise, tahini). I can see how these guys may not look important, but the truth it, there is not another tool that can do the job they do. Kitchen Aid electric mixer. Do I even have to explain this one? I hope not. But I will. If you are going to bake, you need this mixer. Yes, technically, you can use a handheld mixer to get the job done, but it won’t be the same, and it will take forever. I have had my Kitchen Aid mixer for eighteen years, and she has never failed me. I used this mixer when I ran Hurley House out of my home, and the day that she dies, we will bury her in the back yard and thank her for her service. I tend to prefer the models where the neck swings up instead of the models where the bowl moves up and down. It is a personal preference, and I suppose there’s not a wrong choice, but this mixer is my favorite. 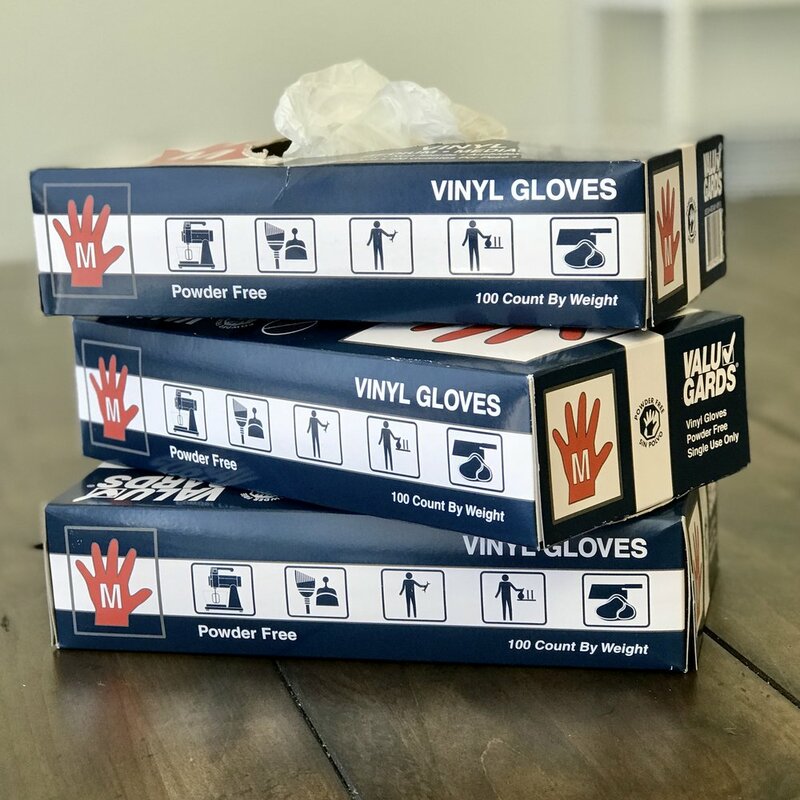 Disposable Gloves. Guys. Just trust me. Buy some disposable gloves, keep them in your kitchen, and consider your life changed. Clean hands are a cook’s best tools. However, washing your hands fourteen times over the course of one recipe gets annoying and will quickly give you dry, cracked skin. Instead of torturing your hands with hot water and soap, slide on a pair of gloves, mix the meatloaf, slide them off, and move on to the next step. Yes, at some point you will need to actually wash your hands, but gloves will help keep that to a minimum. I also find I am much more inclined to touch raw meat and poultry when I am wearing gloves. Sometimes you really gotta get in there, and bare hands can feel wrong when massaging salt underneath chicken skin. Gloves save the day! Sharp knives. High quality knives are important. Sharp knives are even more important. I think I could (and maybe I should) write an entire post on knife maintenance. But here’s the bottom line. The second your knife isn’t doing the job of effortlessly cutting, you are putting your fingers in danger. Dull knives are dangerous, not to mention ineffective. Twice a year, you need to have your knives professionally sharpened. In between sharpening, you need to maintain that edge with a honing stick. High quality knives will stay sharper longer, but even cheap knives need to be kept sharp at all times. Don’t settle for dull knives. Boo’s Block. I am lost without my Boo. When it comes to high quality wooden cutting boards, the bigger the better. Any other type of cutting board is bad news bears for your knives (see above), and you really want a board that is big enough to handle whatever it is you are chopping. I do not put raw meat on this guy, because wood harbors bacteria. I also have never applied the mineral oil to keep it from cracking. Honestly, I know I should, but moisturizing my cutting board is outside my commitment level to said cutting board. I love you, Boo, but I am not going to rub you with oil. Quality Pans. All Clad. Le Creuset. Lodge Cast Iron. These are my top three brands, and between them you will find everything you will every need. Here’s why quality matters. Cheap pans are thin and do not hold heat well. The pan, not the stove, is what cooks your food, and you need it to hold heat in order to do this evenly and effectively. The stove heats the pan, the pan cooks the food. High quality pans are made with high quality metal that is designed and shaped to do one job: hold heat. I cook on a crappy electric stove at home, but with high quality pans, I can ensure my efforts are not in vain. I have built my collection over many birthdays and Christmases. Plus, from time to time, you can find these brands at Home Goods or other discount stores. Do not settle for impostors. Parchment sheets. File this under practical pointers that keep me sane. Kind of like the gloves. If you’re going to bake, you are going to put things on a baking sheet, and you will want those items to come off of the sheet without a fight. Parchment sheets are your answer. They do not hinder the efficacy of the sheet pan, and they make clean up a snap. You can also trace and cut out circles to use in your round cake pans when you bake a cake. Win and win. Glass mixing bowls with room to spare. Why glass? Because you can’t put metal in the microwave, and sometimes you need to melt things in the microwave. Why big? Because when you are mixing, you don’t need a bowl that only holds what you are mixing. You need a bowl that holds what you are mixing with room for you to move it around. I have these in multiple sizes, but my go to is the big guy. The smaller bowls come in handy if I am prepping ingredients (referred to as mise en place) before I cook, and that is a nice. But the bowl I can’t live without is the big one. And there you have it! My eight kitchen tools I cannot live without. Do you have a favorite?